It’s time for another installment of the Noble Grape Challenge. Last episode we explored Grenaches, and today we get to know our new friend Merlot. Wine Folly created the Noble Grape Challenge as a way to learn the spectrum of wine flavours found in red and white wines. Taking nine reds and nine whites, we’ll go through them from lightest to darkest, learning about the key characteristics and flavours of each. 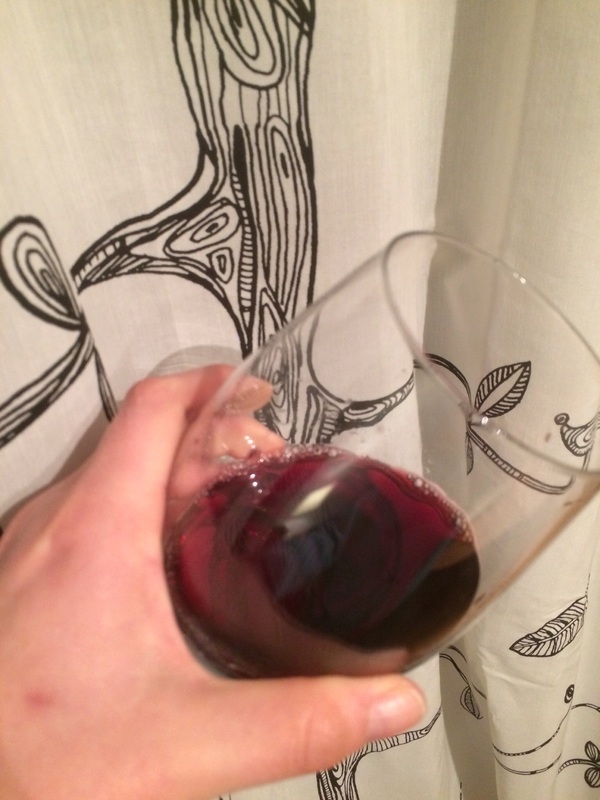 Merlot often gets a lot of hate in the wine world, which isn’t something I agree with. Merlot will always have a place in my heart because it was the first varietal I got to know when I started getting more serious about wine. Don’t expect to hear me muttering these words any time soon. Merlots are pretty middle of the road in terms of body, which is probably part of why they get a bad rap. I think the medium body makes a Merlot quite approachable, especially since it’s often accompanied by a really nice softness on the palate. Soft and versatile – that’s Merlot to a tee. Merlot grapes are grown a lot in France, California (and Washington State) and Italy. Since France and Italy like to blend their grapes I found it a little challenging to find an affordable bottle that was a good price, but I eventually settled on one from California. Flavours vary depending on whether the grapes were grown in a warm or cold climate, but for California Merlots the flavours that tend to stick out are red berries (raspberry, cherry) and some chocolate flavours (mocha, cocoa). I like that Merlots have both zing and depth in their flavour. To try out Merlot I tasted Woodbridge by Robert Mondavi 2013 Merlot. The colour is red with some brownish undertones, and is more opaque than the wines we’ve tried so far in the Noble Grape Challenge. The nose has a bit of wood and smoke on it, which I always love smelling. The flavour was very smooth and inviting – the typical Merlot softness is definitely there. There’s a bit of zingy tannin on the finish, which I’m not a fan of, but overall I like the flavour. I didn’t finish the bottle for this tasting so I’m hoping that the natural oxidation that happens when you open a bottle will help mellow the zing. It’s in line with what I expect from a Merlot, and it’s a good wine for the price. If you’re looking for something that’s a step up I would recommend checking out something from Robert Mondavi Winery (as opposed to the Woodbridge line) or Beringer. Have you tried any Merlots lately? What did you think? Next up in the NGC – Sangiovese! I had a long weekend a couple weeks ago and decided to head home to visit my family. While planning what I’d like to do with my parents the idea of a wine tasting came to mind. It had been a while since we’d done one and we thought, why not? I was also bringing home two good friends who live in the Niagara wine region of Ontario, and so I suggested we frame the tasting as a Canada-Europe grudge match. My stepdad was happy to oblige and managed to find three Canadian reds and three French ones, pairing three different varietals – Merlot, Cabernet Franc and Cabernet Sauvignon. I should note that the French wines are most likely blends (most French wines are) and so my stepdad was probably guided by the region in matching these wines with their Canadian counterparts, since each region specializes in a few different types of grapes. So, how do we do tastings? I thought you’d never ask! 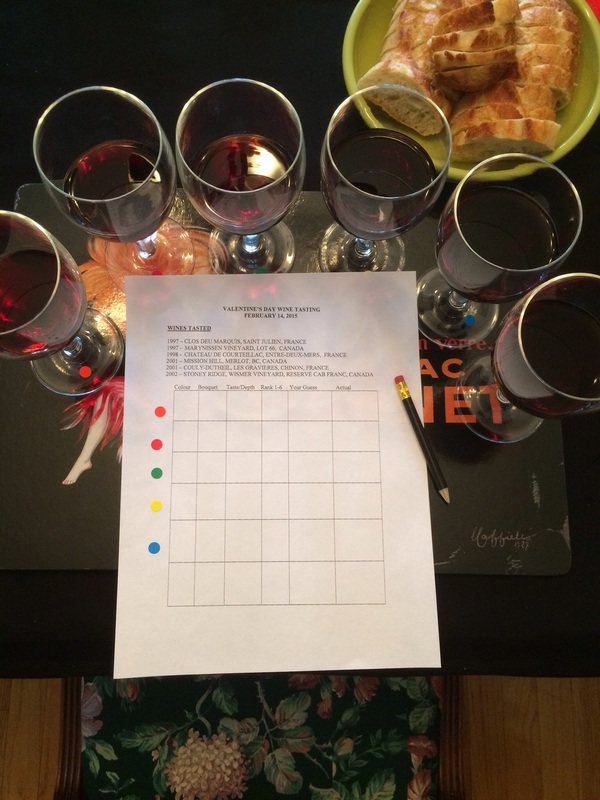 I happily benefit from my stepdad’s years of practice in planning and hosting tastings – by the time I met him he had it down to a science and an art. 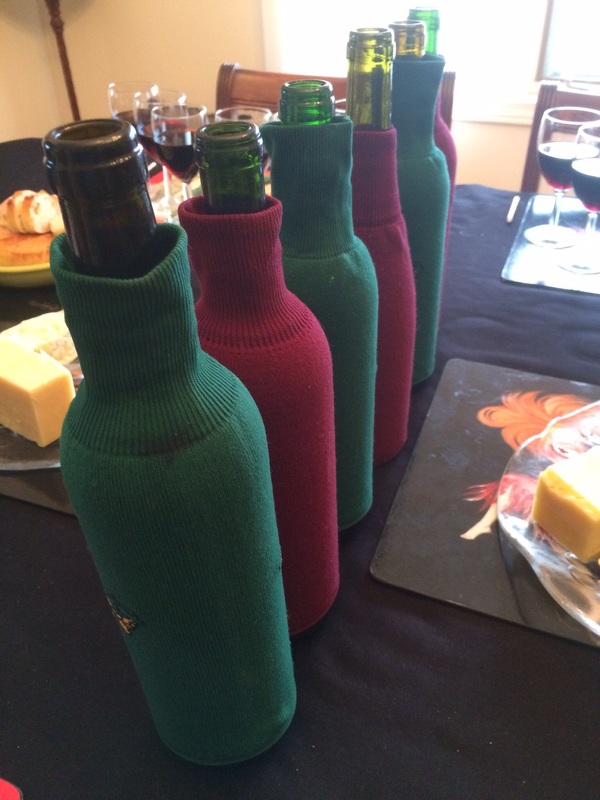 Over the years he has devised a double-blind system that means no one at the tasting will know which wine is which. 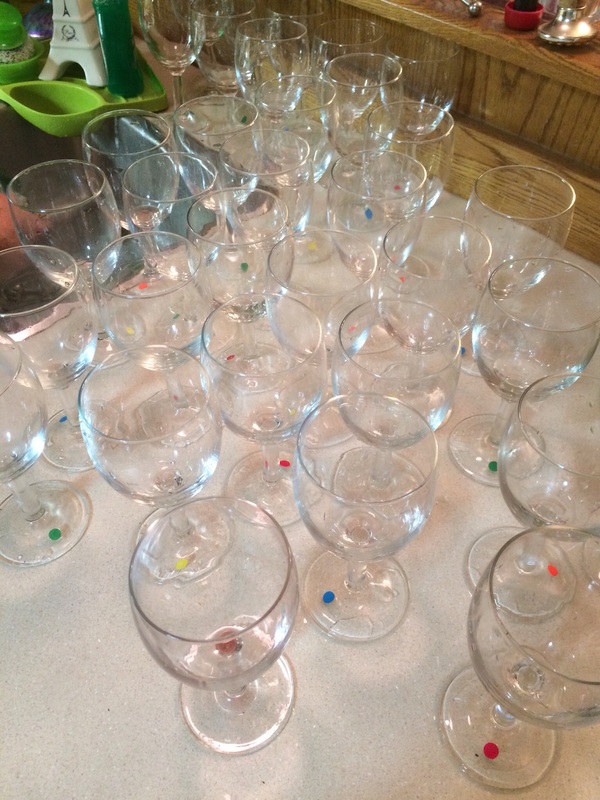 My mom and stepdad are a great wine tasting team – he will open the bottles and either decant them or put them in sleeves, and then she will come by and put a little coloured sticker on each bottle. He doesn’t know which wines are which colour and she doesn’t know which wine she’s labelling – it’s win win! 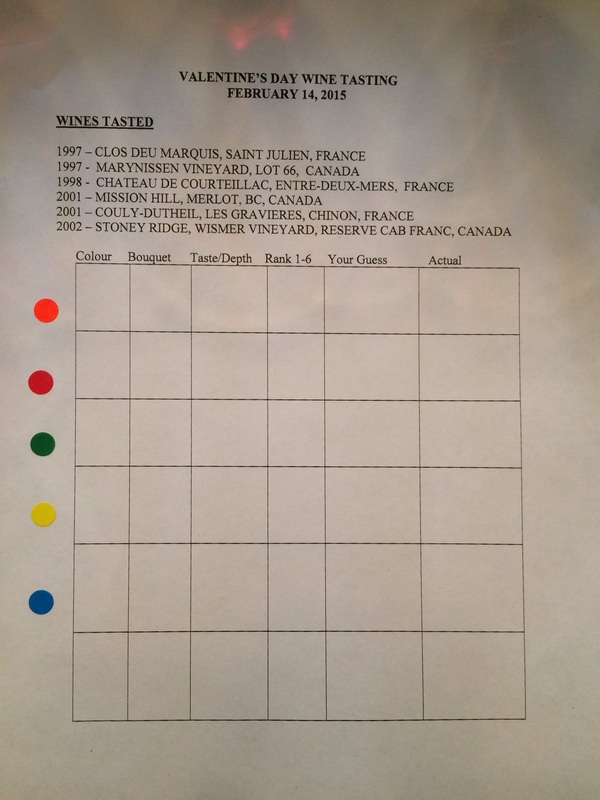 He’s also created a great grid to help structure the tasting. We usually make it an informal and fun affair, and put out cheese and baguette to munch on as we go. The baguette helps cleanse the palate, wiping out the flavour of a wine before going on to another. I usually stay away from the cheese until I’ve finished filling out the grid because the flavour of the cheese will change how you taste the wine, and that usually makes things go haywire for my still-learning palate. So How Did the Tasting Go? 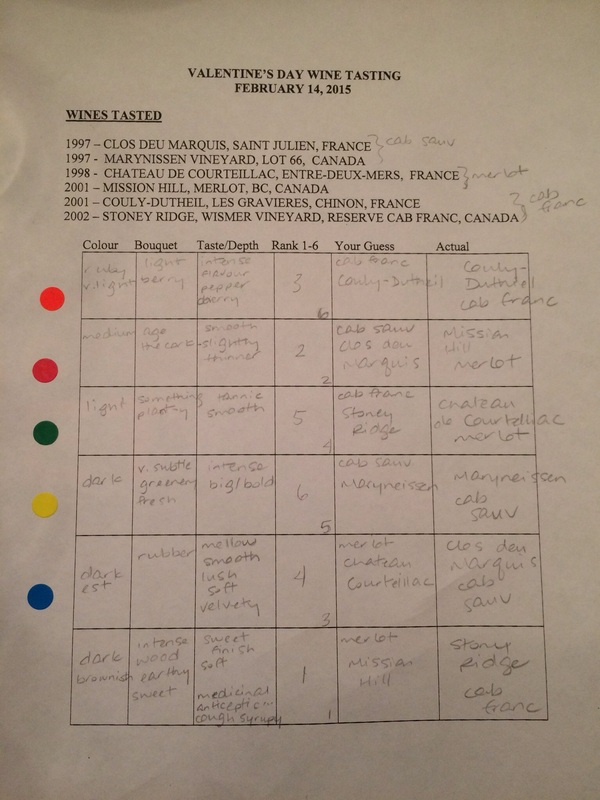 My main goal was to try and correctly identify some wines. It sounds like an easy task but is actually pretty hard! I’m good at knowing the flavours I do and don’t like, and am getting better at being able to differentiate between varietals, but knowing which wine is exactly which? I’ve got a ways to go. I made a bigger effort to fill out the entire grid this time, even though my stepdad always tells us the only thing he needs from us is our rankings (he keeps all the sheets from each tasting he hosts!). These tastings are great practice at being able to identify what I’m smelling and tasting, so I focused on that for the first few minutes. It was a while before I even took my first sip! It was a really tough tasting in terms of the rankings. 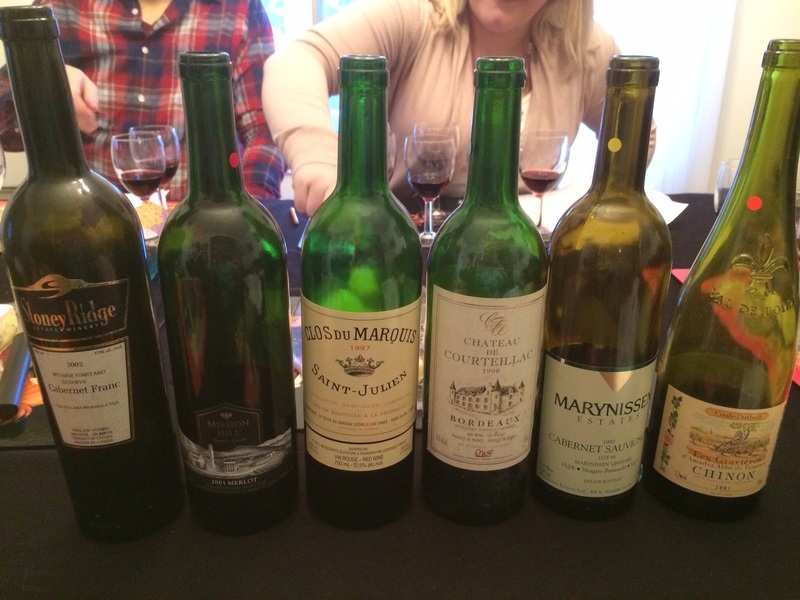 Everyone around the table agreed that we all really liked all the wines! I managed to come up with some sort of ranking, but to be honest I could easily have switched my numbers around and been just as happy. And no, my stepdad wouldn’t let me rank ties – I asked! I managed to correctly identify two of the wines – a new personal best! Interestingly, the averaged rankings are close to my rankings. With one exception, each average rank is only one off from mine, and a couple ranks were the same. All but one of us chose the same wine as our number one pick, and of course once we had averaged our rankings we were all dying to know which wine was which. I can tell you, we were all surprised that a Niagara wine ranked number one! It just goes to show that sometimes a wine or region will surprise you, and that its worth trying new wines because you never know what you’re going to like. Once the grand reveal was over, there was only one thing left to do – go back and re-taste! Like good wine tasters, we finished the bottles. See? 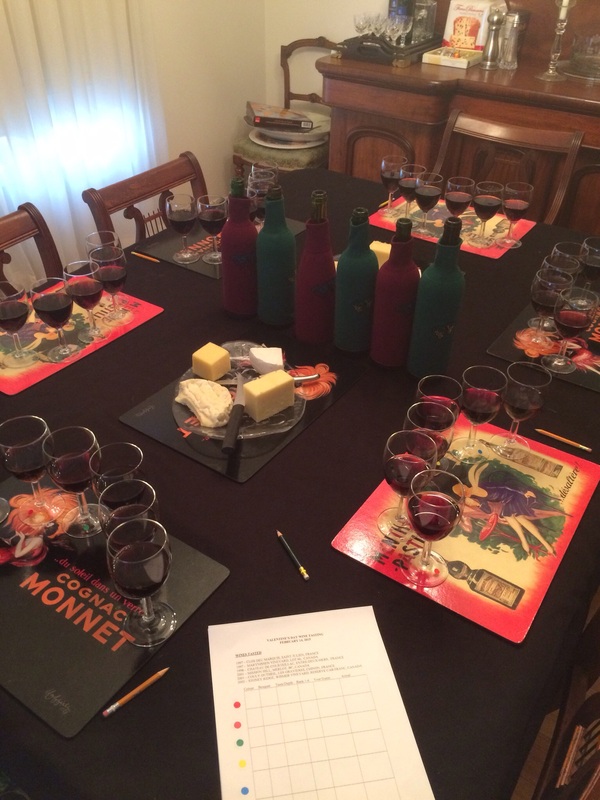 Tastings can be lots of fun, and aren’t very difficult to arrange – you should try it!